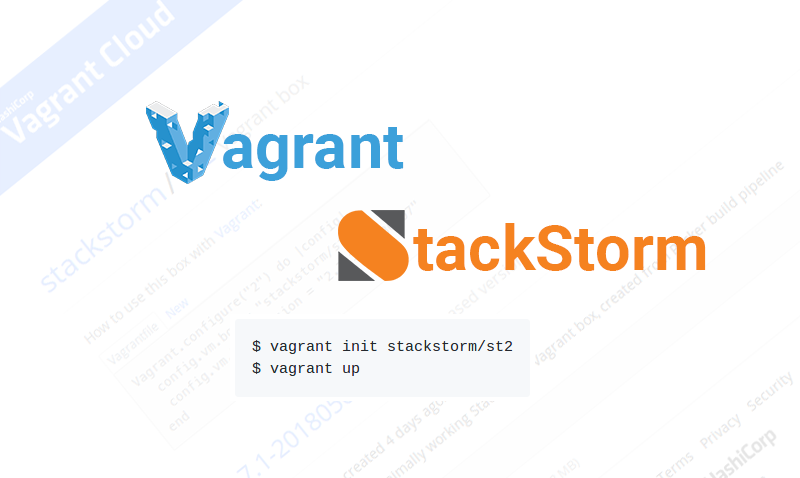 We’re glad to announce that StackStorm Vagrant box and Community OVA are available for general use and included as installation method in StackStorm Docs. Vagrant / OVA is the quickest and easiest way to get complex StackStorm architecture with 9 microservices, Workflow Engine, message queue like RabbitMQ, databases like PostgreSQL and MongoDB, nginx, ChatOps up and running with no hassle. The virtual machine image comes pre-installed, configured and tested. This helps to avoid time-consuming installation and configuration steps. Perfect as a starting point to meet with StackStorm, get a quick platform overview, test, demo or even using StackStorm in isolated from the internet air-gapped systems. We now highly recommend using a Vagrant / OVA to get familiar with the StackStorm platform. It’s a really 2-click experience! Trying StackStorm was never so easy! Many projects have similar pre-packaged Vagrant box that is used for evaluation and simplifies first experience so you don’t need to wait, install, configure anything and suffer if installation failed somewhere in the middle. Let’s leave extensive configuration for other production installers, – just give me working CLI st2 action run, now! An alternative to Vagrant box is Virtual appliance which is available for download as .OVA image from the StackStorm/packer-st2 Github Releases page. It might be especially helpful for running in isolated from the internet air-gapped environments. Only Virtualbox is available for Community edition, but StackStorm Enterprise has more, – just Contact us. Warning! If by any chance you’re using OVA in production environment, don’t forget to change the default StackStorm login credentials and revise SSH authorized keys and password for vagrant linux user. We’ve put in the image a new goodie, – st2-integration-tests. It’s a script that can perform StackStorm infrastructure/integration tests and report back with more detailed info about what and why things don’t work as expected. 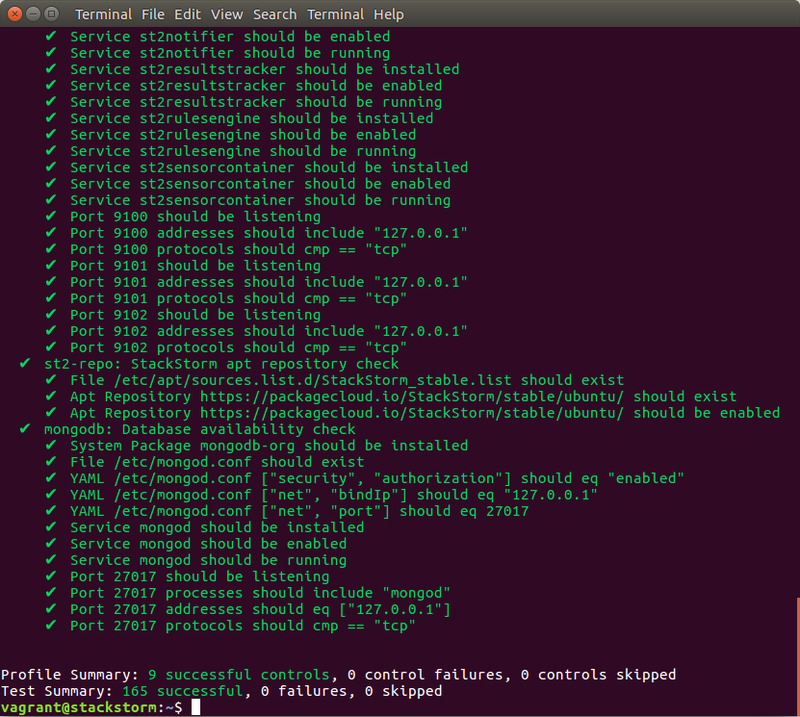 Tests are run at the infra/linux/configuration level. As an example, you’ll quickly be able to tell that MongoDB didn’t start, RabbitMQ is not listening on its port, or that there’s some misconfigured StackStorm or Linux user settings. If something went wrong, – just run st2-integration-tests! We are constantly striving to ensure that you have best experience. However, if you find something that doesn’t work, please let us know and we’ll be glad to take a look. We also love Pull Requests from the community at StackStorm/packer-st2.